either way it's ok, we're just having fun today...." This is the lesson that we (and Foofa from Yo Gabba Gabba) are trying to teach Little Miss these days. She has been playing a lot of Go Fish and a kids' version of Uno and loving it. But sometimes she gets in a funk where she starts whining at the start of a game that she's never going to win. So we are trying to teach her about the power of positive thinking. At the same time, we are trying to instill the values of good sportsmanship and ways to encourage others to do their best too. I am realizing that these are ongoing lessons. 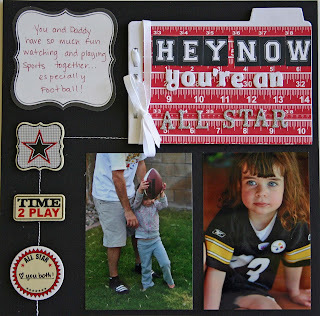 I had a few scrapbooking disappointments lately and started to get into my own version of Little Miss' funk, quickly realized what I was doing and so chatted with her about how I was feeling. And lo and behold, before I knew it, I had an achievement to share with her as well. I was selected to be the October Guest Designer for Coordinates Collections! They had a sketch challenge for this selection. Here is both their sketch and my take on it. I am so excited to receive the kit and start working on it and will share as soon as I can. In case you didn't recognize the malaise you were feeling today, it is Monday. And Monday means the new ScrapTiffany challenge has been posted. This week's challenge is to scrap your All Star. Here is my layout. Be sure to stop by, check out the other amazing creations and submit yours to Tiffany for your chance to enter the monthly drawing for a free kit! Congrats on the Guest Designer position! So exciting. 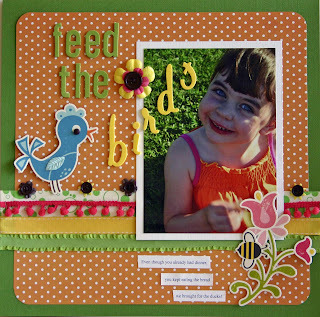 I love the "Feed the Birds" layout with your daughter. Very cute and she is adorable! Great job on the GD position! I love the layout, fun stuff as always!